Welcome to the Western World of artist Bob Kerby. We are excited to present our newest selection of Western Art Creations. Little did Robert E. Kerby know when he left his Colorado home at the age of 17 to become a cowboy it would be the beginning of a love and devotion to the cowboy way of life and The American West. It was while drawing in the bunkhouses on ranches in Northern New Mexico the artistic spark was ignited. Living the life of a cowboy in the American West working with horses, cattle and surrounded by beautiful country Kerby gained firsthand knowledge of his subject matter. He now is recognized as one of the best and most authentic contemporary cowboy artists in America today. Bob paints exclusively in oils and is represented in public and private collections from New York to Australia. His work has been featured on magazine covers and has been reproduced in the form of limited edition collector prints, post cards, posters, Christmas cards, cookbooks and calendars. It is estimated that over 3 million people a year view his famous Range Riders appointment calendars. Good horses, roping, riding and the American West have always been his true passion. Kerby takes pride in his western heritage and wishes to extend this pride to you through his work. We hope you enjoy the western art of Robert E. Kerby. It is Bob's pleasure to share with you his work in the form of his calendars, Limited edition collector prints, Christmas & note cards along with his Range Riders Cookin' cookbooks. Born and raised in Colorado Bob now lives on a small ranch outside Kearney, Nebraska where he maintains the Longhorn Studio. (Kearney is located in the middle of Nebraska on Interstate 80) He paints exclusively in oils and is committed to preserving the life and times of the contemporary cowboy. One of Bob's passions is his horses and team roping. 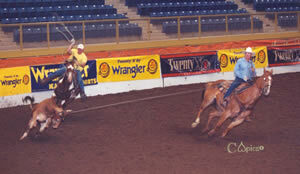 During the Summer you'll find him on one of his geldings roping a few steers in the Kerby arena. His love for horses, the west and the cowboy way of life, can be shared and enjoyed at this web site. We also invite you to give a holler or stop by the studio when you are passing through Kearney, Nebraska!